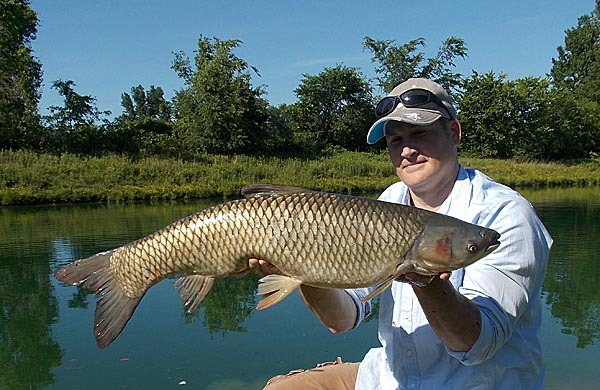 I’ve heard the term ‘Freshwater Bonefish’ used to describe Common Carp and figured I should be able to use it interchangeably for Grass Carp as well. With the day being in the 80’s and bright/sunny, it also gave the day a bit of a Florida-ish feel. A perfect day to catch a big fish, and that’s exactly what I did. I put to use all of my newly found knowledge regarding Grass Carp from the previous day, and like clockwork, hooked up in no time. This time, the fish hitting on a piece of bread kneaded into a dough ball a few inches under the bobber. I would not test fate again putting the fish back in the water before photos, hence the ‘money shot’ above. These fish are downright cool and I’m excited that I have found two places to target them. I know they can grow far bigger than the two I have recently caught and I hope the waters I fish – have even a larger class of fish available. This is a species I plan to target more in the future as it has some unique fun factors. 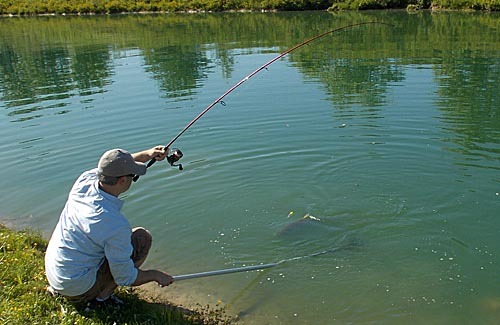 Not just the obvious blast it is to catch large hard fighting fish, but getting to sight fish for them and getting to watch them take the ‘bait’ so close to the surface. Sight fishing is awesome, and I don’t get to do enough of it, this species and where I fish for them is perfect for it.